It seems almost surreal that a missed putt on a golf course in Scotland could knock £90m off a company's value some 3,000 miles away in New York. 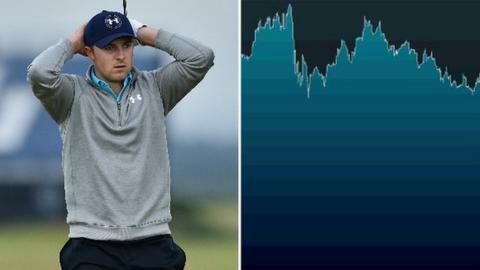 But moments after Jordan Spieth narrowly missed on the final hole of The Open Championship at St Andrews the shares of Under Armour - his sole clothing sponsor - fell in value. Spieth, 21, was closing in on golfing greatness. A win at The Open would have secured the sport's third major title of the year with one to play - a feat not achieved since 1953 - and an unprecedented Grand Slam of the calendar's four majors was on. But as his putt slid by the hole, resulting in him missing out on the play-off later won by compatriot Zach Johnson, investors moved to sell shares in the sports brand. The complexity of share price movement means no single factor or occurrence can be definitely identified as having caused fluctuations. But shares in Under Armour - traded on the New York Stock Exchange - fell from a price of $89.46 six minutes before the putt to $88.79 minutes after his par. The fall of 67c will be of little concern to a company worth about $19bn (£12bn). But multiplied by roughly 215 million shares in issue, the drop still represents a decrease in the company's value of about $140m (£90m). However, don't feel too sorry for investors in Under Armour. The shares have risen by almost 50% in the past 12 months. Why do Under Armour feel Spieth's loss? Under Armour began their sponsorship of Spieth in 2013 but signed him up to a 10-year deal earlier this year, stipulating that he must be head-to-toe in branded clothing for events. The deal was timely for the firm as the Texan soon claimed the Masters and US Open titles. Had he won a third major, interest in him would have soared. Had he then completed golf's first clean sweep at the US PGA Championship in August, his status would have reached incredible heights - excellent news for Under Armour. "Had he been on for the fourth, the hype would have been through the roof," said sponsorship and marketing consultant Nigel Currie. "He'd have been on a level higher than Tiger Woods at the same age. "It would had have been something they as a brand could only have just dreamed about. To have that level of dominance in golf is unthinkable. It takes the whole thing to a new level. "The share price growth may have been in expectation of that. I guess now it's just returning to a normal level."